This carbonated drink mixing system (carbonated beverage mixer) is a kind of production technology based on specific properties of different carbonated drinks. The mixing process will be made according to different ingredients of drinks. The common mixing process of carbonated drinks includes dissolving sugar to make syrup, filtering the sugar syrup, mixing drinks, cooling mixed CO2, and rinsing CIP. Take producing cola for example. It involves dissolving sugar to make sugar syrup, filtering the sugar syrup, cooling down, adding other auxiliary ingredients, mixing with water, customizing volume, mixing CO2 by the mixer, and then filling them. in the middle and high grade beverage production line. The device is used to produce various carbonated beverages that involve carbonating and mixing water, sugar syrup and the gas of CO2 with the right ratios in order to produce aerated water such as lemon, cola. 1. The machine adopts ejector to add CO2 and filling of CO2 employs Venturi ejector. Being able to keep a constant flow volume, the ejector can thus ensure a constant condition of flowing. The mass flow area of air and liquid in this device is large, thus enjoying little resistance force, high efficiency, and energy-saving. Besides, the beverage mixing machine is simple structure, and adopts multistage carbonized pump, which is quite reliable and makes less noise. The stop and start of the equipment are all controlled by frequency changer, thus ensuring the quality of this machine. 2. The carbonated drink mixing system (carbonated beverage mixer) offers precise mixing proportion, and is easy to adjust. With no need to change any components of the machine, it is simple to adjust the output and the proportion between syrup and water. 3. Around the degassing tank, the pressure of dissolved gas that enters the degassing tank is bigger than that of the water surface, and so more than 90% dissolved oxygen goes out from the water. Before entering water tank, the gas of CO2 is put into the deoxygenated water in quantitative way. Besides, fog spray makes the water have larger surface and reduce the diffusion process time of gas in water, thus improving greatly the efficiency of transferring from gas to liquid. The mixer adopts the CO2 reflux to deoxygenate. In that way, it can not only save CO2 gas, but also deoxygenate so that the beverages have better deoxygenating effects. 4. 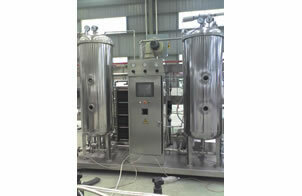 The carbonated drink mixing system (carbonated beverage mixer) uses plated heat exchanger to achieve cooling. When drinking water and thin syrup are going through the scale valve of manual control to be mixed, the pressure-boosted multistage pump enter the plated heat exchanger to make potable water and dilute syrup fully mixed. At the same time, the plated heat exchanger can let ice water go through itself to lower the mixing temperature of thin syrup and drinking water, thus improving the efficiency of carbonized effects. It is also applicable to add some CO2 to the plated heat exchanger before the entering of potable water and syrup to improve mixing effects. 5. It is convenient to adjust gas content of the mixer. According to different requirements of gas content, users can easily make it through proper operation. 6. Perfect automatic control system of the machine has features of harmonious running, simple structure, continuous producing, and high automaticity. 7. The carbonated drink mixing system (carbonated beverage mixer) is equipped with cleaning process flow in the original position with rational construction, thus making it convenient to clean CIP. It reaches the requirements of food hygiene laws. Founded in 2006, our company is a leading manufacturer and supplier of carbonated drink mixing system (carbonated beverage mixer) in China. Here in Topling, we mainly offer bottled water filling line, juice filling production line, carbonated drink filling line and related equipments including rinsing filling capping machine, external brush washing machine, and other related machines. We offer installing and debugging services of our devices and staff training for factories abroad and OEM service. For more guides of carbonated drink mixing system (carbonated beverage mixer), please contact us.